If you're smart, you'll just buy a pattern and learn how to use it. I'm not smart, and I'm intimidated by stupid things - like using patterns and playing kickball (one good fly-ball to the face will do it). I may be doing a disservice by not just saying, "Get real. 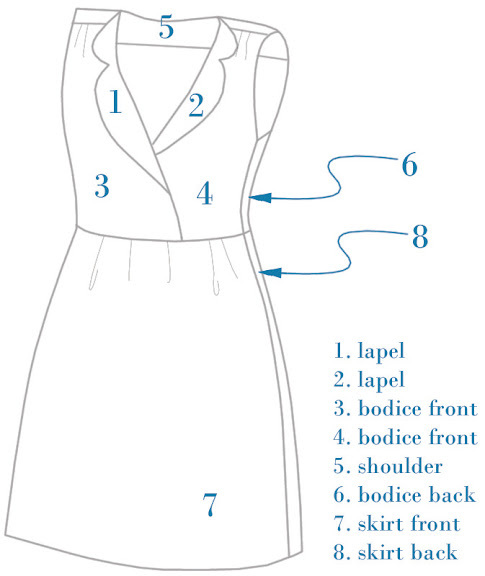 Learn how to use a dress pattern." I just happened to figure out something all by myself, and that so rarely happens that now I'm telling the world about it. The instructions here will apply specifically only to this one dress, but they can probably be parlayed to a lot of simple sundresses. And since I find myself buying multiple colors of every item in my summer wardrobe (cotton being cheaper than wool), maybe it will be useful to some people who have a simple, flattering dress they love. I bought this dress on deep discount a couple of weeks ago and had it taken in to fit better. I'm always looking for sleeveless shirtwaist dresses, and in all my years of idle searching, I've never found one I love. This one is flattering and versatile, but the pale yellow color doesn't excite me. Since it fit like a glove, post professional alteration, and it's built so simply, I thought I'd have a go at copying it. The dress comprises only eight simple panels, and there are no tricky darts - just a bit of shirring at the waist and shoulders. I estimated three yards of fabric, with the help of a nice lady at the fabric store. I chose a fabric with a random, organic pattern, rather than a stripe or check that would be hard to hide mistakes in. I washed and dried my fabric, pressed it, laid it flat, and did my best to trace each of the dress's eight panels, giving about a 1" seam allowance, and estimating another allowance where the panels were shirred. I put the right-side lapel on top of the right-side bodice front, with wrong sides of fabric facing each other. Then I straight-stitched the shape of the lapel, turned it right-side-out, and pressed it. Repeat with the other side. The ends of the lapel panels will "float" inside the dress. Then I attached the neck/shoulder panel to the back panel - just a straight seam. Here was my favorite discovery, which everyone probably already knows to do: To make the contoured arm-holes, I cut out four small scraps of fabric, and laid one scrap on each of the bodice fronts, and on each side of the back, at the armhole contours, wrong sides facing each other. Then, for each piece, I sewed along the contour of the armhole, turned the pieces right-side-out, and pressed them. Perfect contoured seams! Lastly, I turned the dress inside-out and sewed the seam on the left side of the dress. On the left side, I installed an invisible zipper, which I described in this project. (Make sure to whipstitch the top edges of the zipper so that the zipper head won't slide right off. This idiot did that.) Continue to sew to the bottom of the skirt, after the zipper ends. Press the skirt hem, and sew an invisible hem. So much invisible sewing! Make a simple sash to tie the waist. 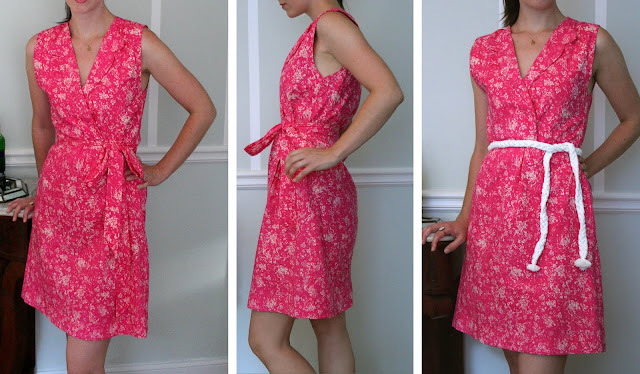 Be totally shocked that you don't look like an idiot or a crazy person in the reasonably flattering dress you just made!
. . . yeah, but you ALMOST had that fly-ball. Very cute. Very good idea to copy a dress you like. Most commercial patterns are badly designed, even if you alter them to fit you.